The Computex exhibition usually showcases the ability of Taiwanese hardware makers to bring down the costs of computer parts and systems. 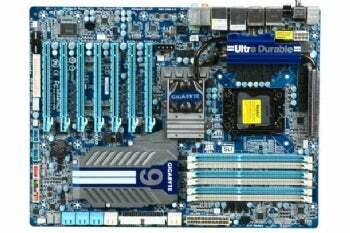 But Gigabyte Technology is bucking the trend with a motherboard that costs more than many fully configured computers. Gigabyte's US$700 GA-X58A-UD9 motherboard is designed for overclockers, PC enthusiasts who enjoy pushing their systems to see how much performance can be squeezed from them. The motherboard's $700 price tag excludes the cost of other components, such as the processor, memory, graphics cards, and other components. Among the X-58A-U9's features are the use of high-end components, such as capacitors made in Japan, and the ability to send 1,500 watts of power to the CPU. Since a processor's clock speed is tied to power, this can give a substantial boost to the speed of a processor like Intel's six-core 3.33GHz Core i7-980x Extreme Edition. As 1,500 watts is more power than any processor can handle, overclockers can comfortably push their systems' performance without straining the motherboard's power limit. "That gives them cleaner, better power," said Tim Handley, deputy director of motherboard marketing at Gigabyte. Features include USB 3.0, seven PCI expansion slots, and four-way SLI and CrossfireX, which allows users to install up to four Nvidia or Advanced Micro Devices graphics cards on the motherboard. The X58A-UD9 was initially intended as a limited edition motherboard but that changed when demand proved to be stronger than expected, demonstrating that there is "sustainable" demand for high-end motherboards in the market, Handley said. "Our sales run rate is double what was expected," he said, without disclosing the specific number.